[116 Pages Report] The sinus dilation devices market is expected to grow from USD 1.67 billion in 2017 to USD 2.78 billion by 2023, at a CAGR of 9 .1 % from 2018 to 2023. Growth in this market is mainly driven by the high prevalence of chronic sinusitis, growing preference for minimally invasive procedures, benefits of balloon sinuplasty/sinus dilation over conventional sinus surgeries, and favorable reimbursement scenario for sinus procedures in developed countries. The base year considered for the study is 2017, and the forecast has been provided for the period between 2018 and 2023. Balloon sinus ostial dilation (also known as balloon sinuplasty) is a minimally invasive surgical procedure used as an alternative to traditional endoscopic sinus surgery for patients with chronic sinusitis who fail medical management. In this procedure, a balloon-like device is inflated to push the sinus tissue or bone out so that it can create an airway passage and allow the drainage of nasal secretion. Some of the advantages offered by these devices are better prognosis, quick recovery time and less invasive procedure with minimized pain. The growth in this market is driven by various factors namely rising prevalence of chronic sinusitis, increasing preference for minimally invasive surgical procedures, and the rising focus of market players on launching novel and advanced balloon sinus dilation devices. For instance, in July 2016, Acclarent launched RELIEVA SCOUT Multi-Sinus Dilation System in the US. Similarly, in February 2015, Entellus launched the XprESS Ultra Multi-Sinus Dilation System, the third device in the XprESS family of balloon sinus dilation systems. The continuous launch of products in the balloon sinus dilation devices category is further driving the growth of this market. During this research study, major players operating in the sinus dilation devices market in various regions have been identified, and their offerings, regional presence, and distribution channels have been analyzed through in-depth discussions. Top-down and bottom-up approaches have been used to determine the overall market size. Sizes of the other individual markets have been estimated using the percentage splits obtained through secondary sources such as Hoovers, Bloomberg BusinessWeek, and Factiva, along with primary respondents. 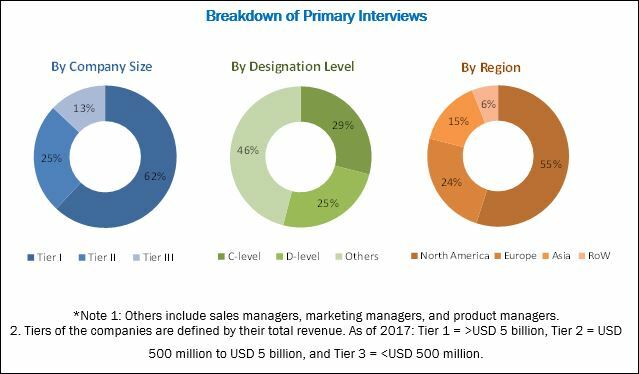 The entire procedure includes the study of the annual and financial reports of the top market players and extensive interviews with industry experts such as CEOs, VPs, directors, and marketing executives for key insights (both qualitative and quantitative) pertaining to the market. The figure below shows the breakdown of the primaries on the basis of the company type, designation, and region considered during the research study. The sinus dilation devices market comprises various small and large players. Key players in this market include the major players in the market are Entellus Medical Inc. (subsidiary of Stryker) (US), Acclarent Inc. (subsidiary of Johnson & Johnson) (US), Medtronic plc (Ireland), Smith & Nephew plc (UK), Intersect ENT Inc. (US), and Olympus Corporation (Japan). Other players in the market include Meril Life Sciences Pvt Ltd. (India), SinuSys Corporation (US), InAccel (India), Jilin Coronado Medical Ltd. (China), dalENT Medical (US), and Creganna Medical (Ireland). In December 2017, Stryker completed the acquisition of Entellus (US), a pioneer in providing minimally invasive technologies that enable procedures to be performed in more cost-effective sites of service in the space of sinus dilation. What are new channels that the sinus dilation devices companies are exploring? 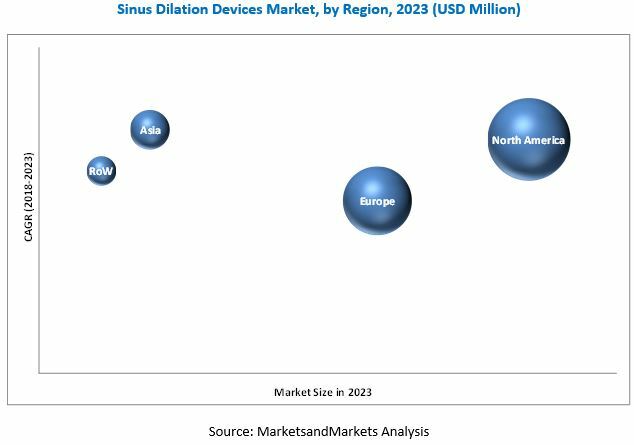 The overall sinus dilation devices market is expected to grow from USD 1.80 billion in 2018 to USD 2.78 billion by 2023 at a CAGR of 9.1%. High prevalence of chronic sinusitis, growing preference for minimally invasive procedures, benefits of balloon sinuplasty/sinus dilation over conventional sinus surgeries, and favorable reimbursement scenario for sinus procedures in developed countries are the key factors driving the growth of this market. Sinusitis is a very common medical condition that is caused due to the inflammation or swelling of the tissues lining the sinuses. Sinus dilation devices expand the sinus opening of the nose during sinus surgeries, thereby treating the drainage problem associated with nasal sinuses. Sinus dilation devices also include endoscopes and handheld devices used for visualization and support during sinus dilation procedures. The sinus dilation devices market has been segmented, on the basis of product, into balloon sinus dilation devices, endoscopes, sinus stents/implants and handheld instruments. The endoscopes segment is further divided into sinuscopes and rhinoscopes. The market for sinus stents/implants is expected to grow at the highest CAGR between 2018 and 2023. The benefits of sinus stents/implants such as their drug eluting functionality and reduced scarring and inflammation contribute to the rapid growth of the market. The sinus dilation devices market in Asia is expected to grow at the highest CAGR during the forecast period. Asia is the fastest-growing market for sinus dilation devices. The increasing disposable income and improving standards of living in this region with large population base has increased the consumption and use of technologically advanced products such as sinus dilation devices for the cure of chronic sinusitis, which, in turn, has increased the growth of sinus dilation devices market in this region. Furthermore, increasing medical tourism, and high prevalence of sinus-related diseases in the region has also contributed for the high growth and significant share of the overall sinus dilation devices market. Hospitals is one of the patient care settings where sinus dilation devices are extensively used. This segment holds the largest market share due to high number of outpatient sinus dilation procedures, the advantages of having integrated healthcare facilities, the availability of technologically advanced infrastructures, and the ability to perform complex sinus surgeries. Ambulatory surgical centers (ASCs) provide healthcare services and primary care to patients in an outpatient capacity. The minimally invasive procedure such as balloon sinus dilation can be easily performed in ASCs. Factors such as better infrastructure in ASCs are driving the growth of this segment. The cost-effectiveness coupled with the better reimbursement scenario than hospitals is also driving the growth of this segment. Increasing number of treatable patients in ENT clinics, faster recovery time, cost-effectiveness, and growing preference for minimally invasive techniques are some of the factors driving the growth of this segment. In 2016, out of the 188,000 patients suffering from chronic sinusitis, 160,000 (85%) patients performed the balloon sinus dilation procedure in ENT clinics/in office in the US (Source: Entellus Presentation 2017. What are the trends for patient care setting? Dearth of Skilled Otolaryngologists and ENT Surgeons is a major challenge for the growth of the market. Currently, several countries are facing a shortage of skilled professionals who are capable of effectively performing ENT procedures. In 2012, there were 8,600 otolaryngologists in the US, and it is estimated that there will be a shortage of 2,500 otolaryngologists in the country by 2025 (Source: Pubmed.gov). Furthermore, underdeveloped countries and regions face this problem on a much wider scale. The dearth of skilled ENT surgeons in these countries is expected to limit the number of ENT procedures performed in spite of the presence of a large target patient population base. This is considered as a major challenge for market growth. Key players in the market include The major players in the market are Entellus Medical Inc. (a subsidiary of Stryker) (US), Acclarent Inc. (a subsidiary of Johnson & Johnson) (US), Medtronic plc (Ireland), Smith & Nephew plc (UK), Intersect ENT Inc. (US), and Olympus Corporation (Japan). Other players in the market include Meril Life Sciences Pvt. Ltd. (India), SinuSys Corporation (US), InAccel (India), Jilin Coronado Medical Ltd. (China) and dalENT Medical (US). These players are increasingly undertaking mergers and acquisitions, and product launches to develop and introduce new technologies and products in the market. 12.8 Meril Life Sciences Pvt Ltd.
12.9 Jilin Coronado Medical Ltd.